A deep tinted mirror is raised from the ground to recreate the mystic reflection effect of perfectly still water. Everything around is mildly reflected on the surface, supported by a conical shell that mysteriously disappears in the shadow. Structure matt lacquered in the colours: slate grey, night blue, dark red. 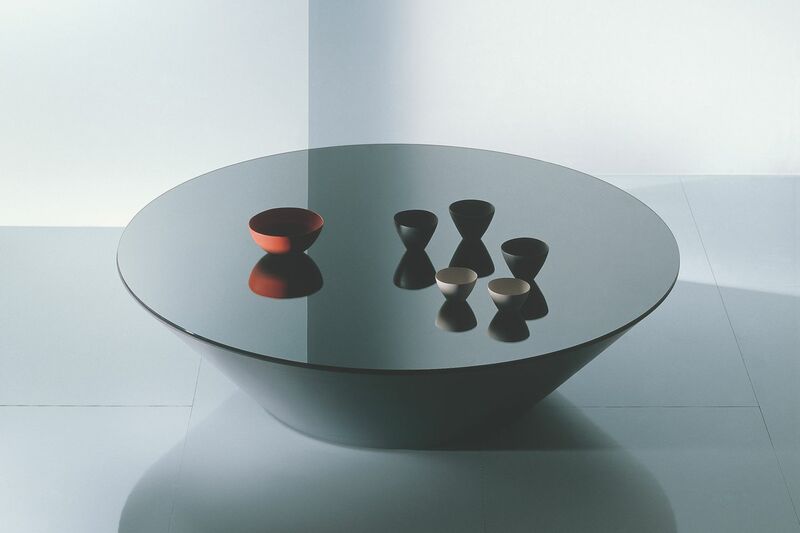 Reflecting top finishes: silver mirror or OXID slate grey, night blue, dark red. OXID is a special ''pirolite'' glass with particular deep reflecting effects. Easy to move thanks to hidden wheels in the base. TOP: glass tops 4 mm silvered, white or black float glass tops or Oxid glass with grey, blue and red varnish with reflecting effect. MDF safety support (19 mm thick). BASE: high density polyurethane panel, protected by texturised matt polyurethane varnish.